I have been having the hardest time these days getting my toddler to take a bath. She used to love to splash in the bath with her sister but these last few months it has been like pulling teeth. Don’t even get me started on brushing teeth… that in itself is like, umm pulling teeth! I found a great idea about making “glow water” over at “Growing a Jeweled Rose’s” Site – I was blown away by all the fun ideas we could do with glow in the dark glow water and black lighting. 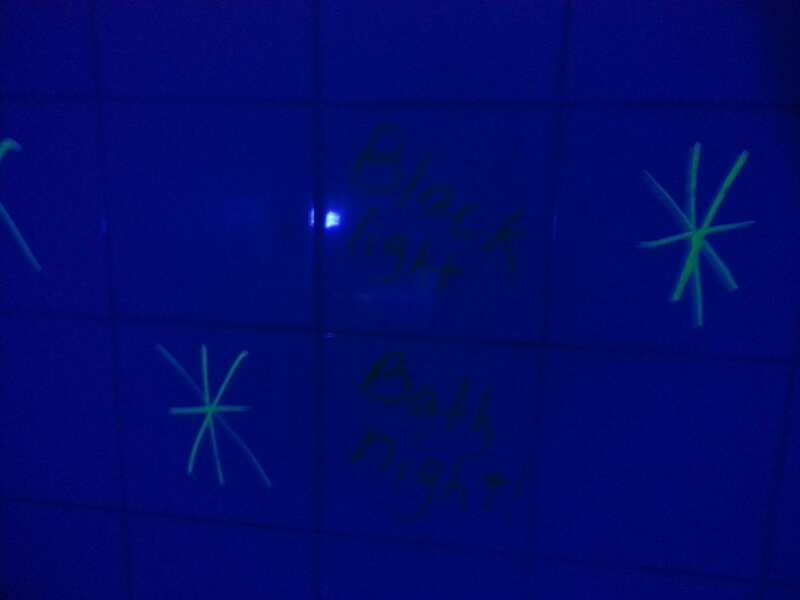 My first step was to get my little girl to fall in love with playing in the bath tub again- my next plan will be to transform my downstairs play area into a black light sensory fun haven… “baby steps” I said to myself. I will let my husband in on the plan in a few months! 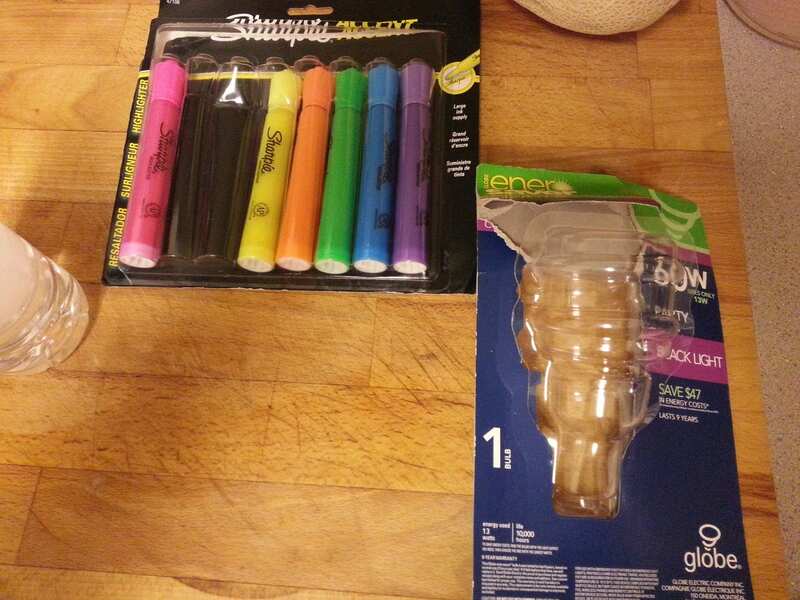 I purchased a black light bulb from Walmart (for about $5) and some Highlighters ($5). I found that the Sharpie brand were the easiest to work with. I pulled off the end of the high lighters with some scissors and placed them in a plastic water bottle. I also bought a cheaper brand of high lighters that worked well too. 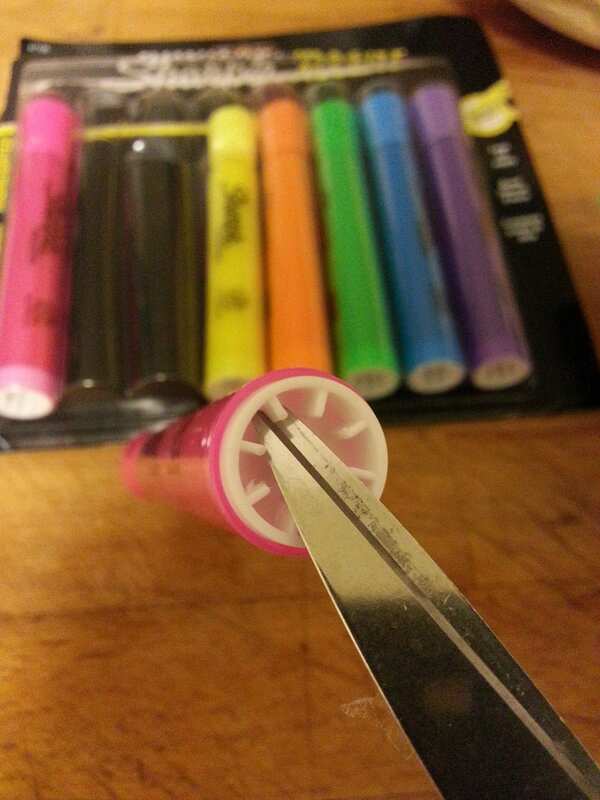 Only I could not for the life of me get the cap off the base of the highlighter. I even used my teeth when the kids were not looking! (don’t try this at home kids..) I cut my lip somehow – no fun. Save yourself the hassle and get the sharpie ones. I took some scissors and pried the cap off, it was easy. I kept some water in so it could be shook up. You can add white beads, and sparkles or little “lost toys” like I use when I make my “magic find bottles” Make sure the cap is on tight. Though these markers are non toxic I am not sure if it would be fun to have the water bottles spill open and colouring your child like Wesley from the Lorax. The yellow Glow High lighters worked best for this. I tried the pink, and it was alright, but the blue and purple had no “magic” at all. I looked for all kinds of toys that had some white to them, or were made of that glowing plastic. Next time I will add some tonic water to the water and it is supposed to make it glowing too. You can see here that my shower curtain is white so it really glows. I took one of the markers and coloured little stars on the walls. They cleaned right off afterwards. what an impact with a white shower curtain. We have done this a few times now and the kids really love it.  We have even added glow sticks to the water. Next time, I will add some tonic water and see if it glows like they mentioned in the website. I hope you try this idea- It definitely adds a whimsical feeling to bath time. Fun! I’m just worried my kids wouldn’t take a regular bath after we try this. Maybe I’ll wait until it’s a struggle to get them in the tub. It really is fun! My little one has done regular baths since. Its pretty easy since we have the lightbulb on a little lamp that I just bring into the bathroom. 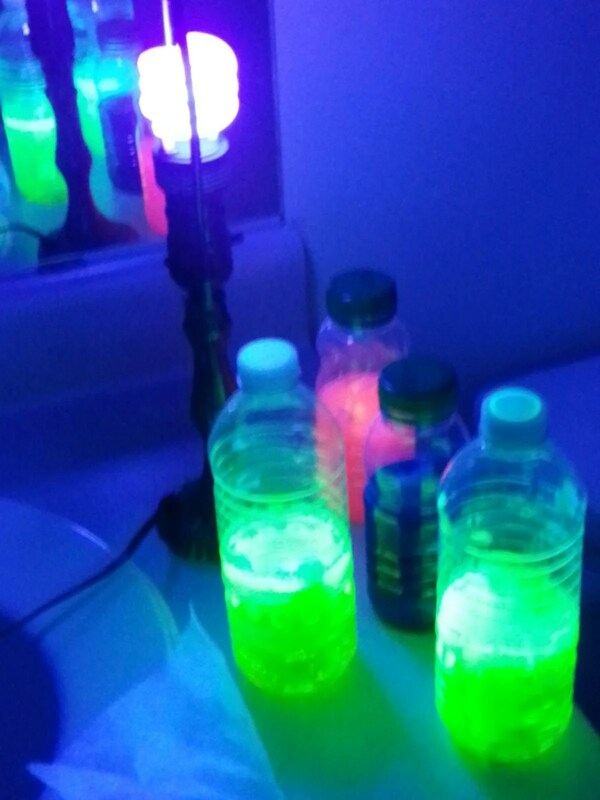 The glow bottles are still with the regular bath toys. We just nix the gliwsticks since that can set you back a few bucks every bath. this sounds so super cool!! thanks!!! Wow, this is simply amazing! I had truly never thought of something like this. I’m quite impressed by the creativity of it.